On a breezy Paris afternoon in 1901, more than two years before the Wright Brothers even invented the airplane, the only real contender anywhere set out to claim aviation’s first great prize. 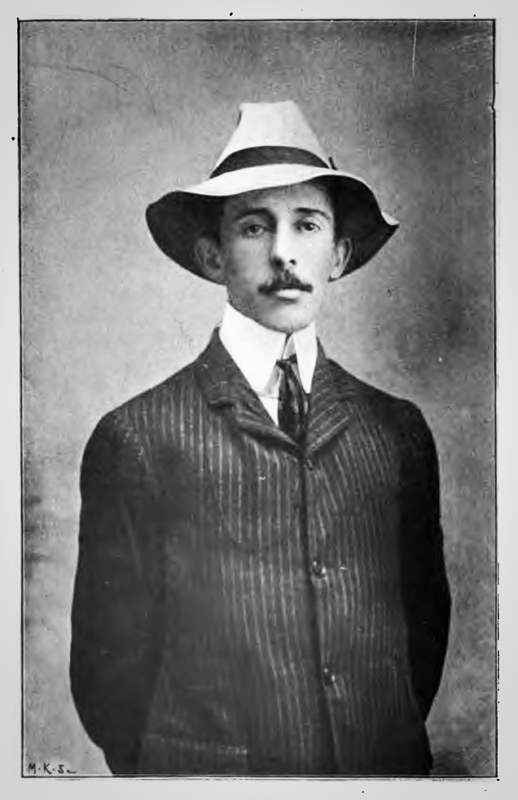 That visionary aviator was Brazilian emigré Alberto Santos-Dumont, and his goal was the 100,000 franc Deutsch Prize. When people ask you who invented the airship, please don’t say ‘von Zeppelin’. 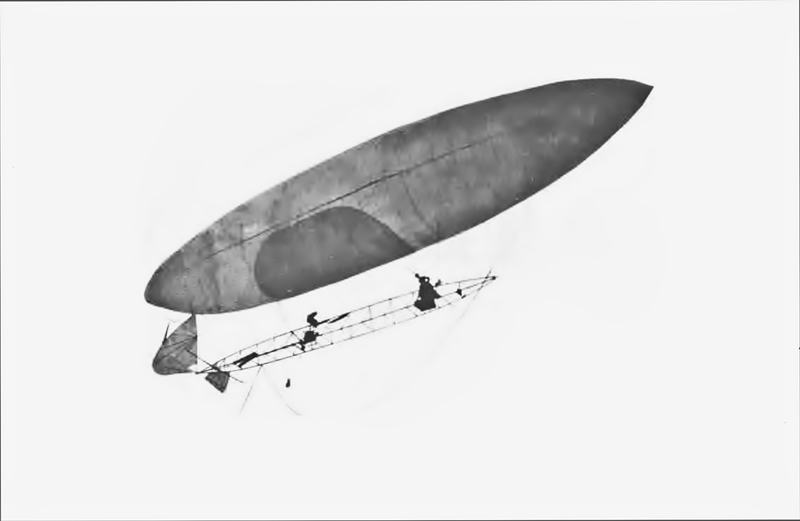 The idea of a dirigible (literally “steerable”) balloon had first been floated (excuse the pun) in France during the 1880s, but Santos-Dumont made it a reality. He was the the first to adopt an elongated shape for balloons; the first to add a petrol motor, propeller and rudder; the first to use a weight-shift trim system; and the first to install pressure compensation. He was also the first engineer to “add lightness” to his aircraft designs. The conditions of Deutsch Prize itself were deceptively simple. The aeronaut had to rise from Saint Cloud by the Seine, circle the Eiffel Tower some three-and-a-half miles away, then fly back again. Eleven kilometres plus the turn, within 30 minutes. However contenders had to give the judges 24 hours’ notice of their attempt – plenty of time for a capricious motor to fail, or the more capricious Paris weather to turn hostile. Still, 100,000 francs for 30 minutes’ work was not to be sniffed at. It’s still an extremely respectable USD $17,000 at current exchange rates, and worth a staggering half-million dollars in today’s money). 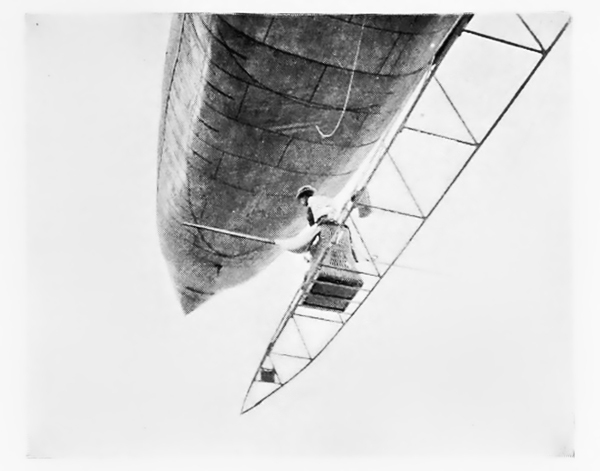 Santos-Dumont had attempted the prize on July 13, 1901, in his No.5. However triumph turned to disaster when his motor failed over the finish line and he was blown back onto rooftops along the Seine. By mid-August 1901, his improved No.6 was ready and, once again, he started preparing for the historic flight. ” The volume of my new balloon was 630 m3, giving an absolute lifting-power of 690kg; but the increased weight of the new motor and machinery nevertheless put my disposable ballast at 110kg. 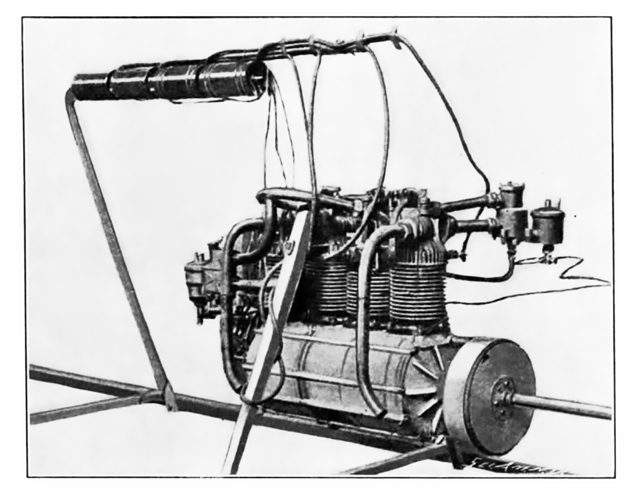 It was a four-cylinder motor of 12 horse-power, cooled by the circulation of water round the piston heads (culasse). While the water-cooler brought extra weight, I was glad to have it, for the arrangement would allow me to use the full power of the motor without fear of overheating or jamming. At full power, the propeller would have a traction-effort of 66kg. My daily practice with the new air-ship ended on September 6th, 1901, with a slight accident. The balloon was re-inflated by September 15th, but four days later it crashed against a tree during a too-sudden turn. I’ve always taken such accidents philosophically, looking on them as a kind of insurance against more terrible ones. Were I to give a single word of caution to all dirigible balloonists, it would be, ‘Keep close to the earth!’. The airship does not belong at higher altitudes and it is better to catch in the tops of trees, as I used to do in the Bois de Boulogne, than to risk the perils of the upper air without the slightest practical advantage! 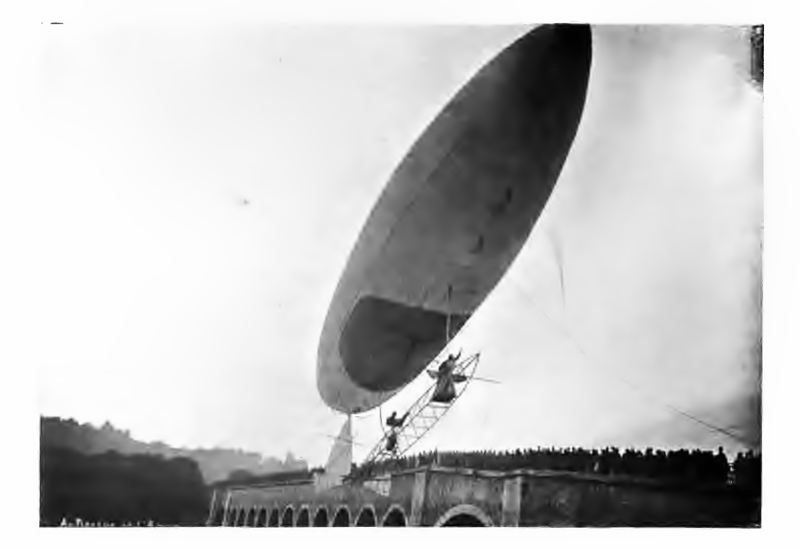 At last, on October 19th, 1901, my airship Santos-Dumont No. 6 having been repaired with great speed, I tried again for the Deutsch Prize. The day before, I had watched the weather with some concern. Nevertheless I sent out the telegrams convoking the commission and the weather did improve through the night. However the conditions at two o’clock that afternoon – the hour announced for the trial – were so unfavourable that only five of the twenty-five members composing the commission felt required to make an appearance: M. Deutsch de la Meurthe himself, along with de Dion, Fonvielle, Besangon, and Aime. The Central Meteorological Bureau, consulted at this hour by telephone, reported a southeast wind blowing six meters per second (11.66 knots) at the altitude of the Eiffel Tower. Considering how content I was in 1898, when my first airship had gone at a rate of seven meters per second, I am still surprised at the progress made in those first three years. Here I was setting out to win a timed race in a wind blowing almost as fast as my first airship’s highest speed! The official start took place at 2.42 pm. In spite of the wind striking me sidewise, with a tendency to take me to the left of the Eiffel Tower, I held my course straight to that goal. Gradually I drove the airship onward and upward to a height of about ten metres above the top. In doing so I lost some time, but protected myself against accidentally contacting the tower. As I passed the tower, I turned with a sudden movement of the rudder, bringing the airship round the tower’s lightning-conductor at a distance of about fifty metres from it. Thus, the tower was turned at 2.51 pm; the run of five-and-a-half kilometres plus the turn having been done in nine minutes. The return trip was longer, being into the teeth of the wind. Also, the motor had worked fairly well during the trip to the tower. Now, after I had left it some five hundred meters behind me, the motor was actually on the point of stopping! In a moment of great uncertainty, I had to abandon the steering-wheel for a moment, at the risk of drifting from my course, in order to devote my attention to the carburettor and the lever controlling the electric spark. Then the motor, which had almost stopped, began to work again. I had now reached the Bois de Boulogne where, by a phenomenon known to all aeronauts, the cool air from the trees began making my balloon heavier – or, more correctly, smaller through contraction. By an unlucky coincidence, the motor chose this moment to begin slowing again. Thus I found my airship descending, with its motive power decreasing! To correct the descent, I threw back both the guide-rope and shifting-weights. This caused the airship to point diagonally upward, so that what propeller-force remained caused it to climb into the air. I was now over the crowd on the Auteuil race-track, and pointing sharply upward. I could hear the applause of this mighty throng when, suddenly, my capricious motor started working at full speed again. The propeller, being almost under the high-pointed airship and suddenly accelerated, exaggerated my angle of incline and the applause of the crowd below changed to cries of alarm. As for myself, I had no fear. I was over the trees of the Bois, whose soft greenery always reassured me. All this happened very quickly of course; faster than I could shift my weights and guide-rope back to their normal horizontal flight positions, and I was soon at an altitude of one hundred and fifty metres. Of course I might have checked the climb of the air-ship by the simply slowing the motor that was driving it upward; but I was racing against a time limit and so I just went on. I soon righted myself by shifting the guide-rope and weights forward. I mention this incident because at the time many of my friends imagined something terrible was happening. All the same, I did not have time to bring the airship to a lower altitude before reaching the timekeepers in the Aero Club’s grounds – a thing I might also have done by slowing the motor. This is why I passed so high over the judges’ heads. On my way to the Eiffel Tower I never looked down on the housetops of Paris. I navigated in a sea of white and azure, seeing nothing but the goal. On the return trip I had kept my eyes fixed on the verdure of the Bois de Boulogne and the silver streak of river where I had to cross it. Now, at my high altitude of one hundred and fifty metres and with the propeller working at full power, I passed above Longchamps, crossed the Seine, and continued on at full speed over the heads of the commission and the spectators gathered in the Aero Club’s grounds. At that moment it was eleven minutes and thirty seconds past three o’clock—making the time exactly twenty-nine minutes and thirty seconds. The air-ship, carried by the impetus of its great speed, passed on, as a race-horse passes the winning-post, as a sailing-yacht passes the winning-line, as a road-racing automobile continues flying past the judges who have snapped its time. Like the jockey of the racehorse, I then turned and drove myself back to the aerodrome, to have my guide-rope caught and be drawn down at twelve minutes forty and four-fifths seconds past three, or thirty minutes and forty-one seconds from the start. I did not yet know my exact time. 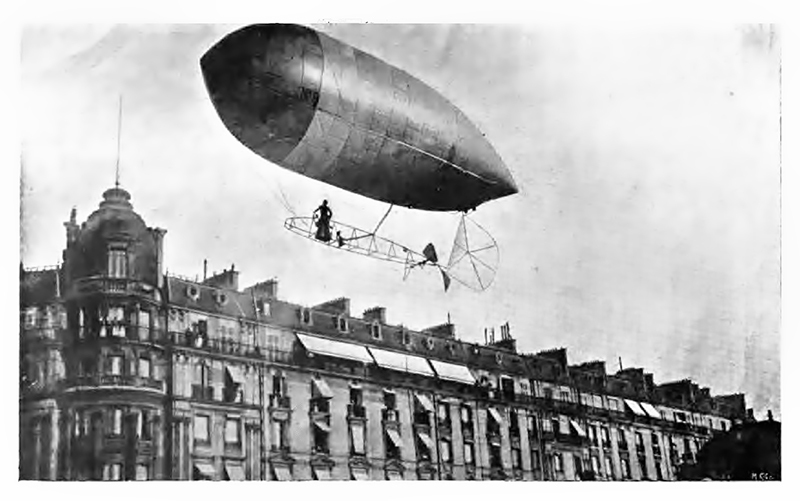 From Dans l’Air by Alberto Santos-Dumont, Librairie Charpentier at Fasquelle, 1904. 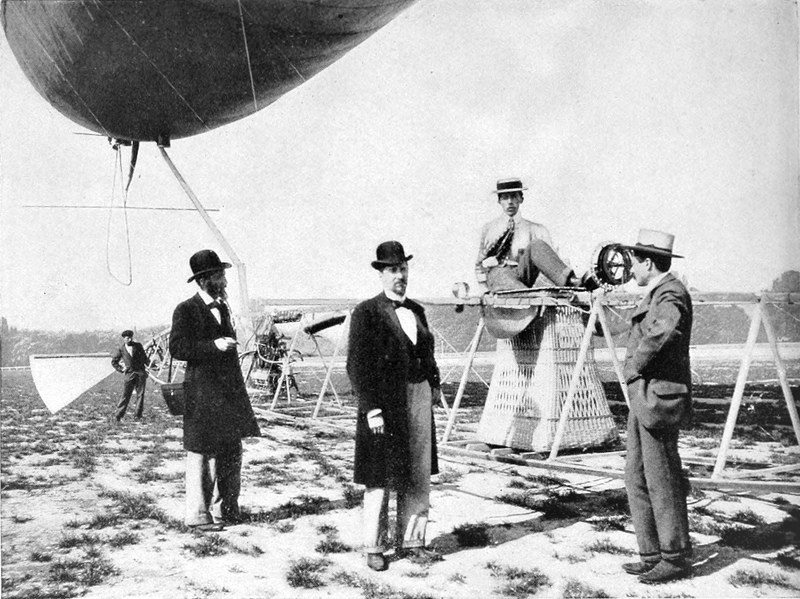 After the flight, some argued Santos-Dumont’s time should be calculated to the moment he reached the St.Cloud aerodrome, rather than when he passed over it. 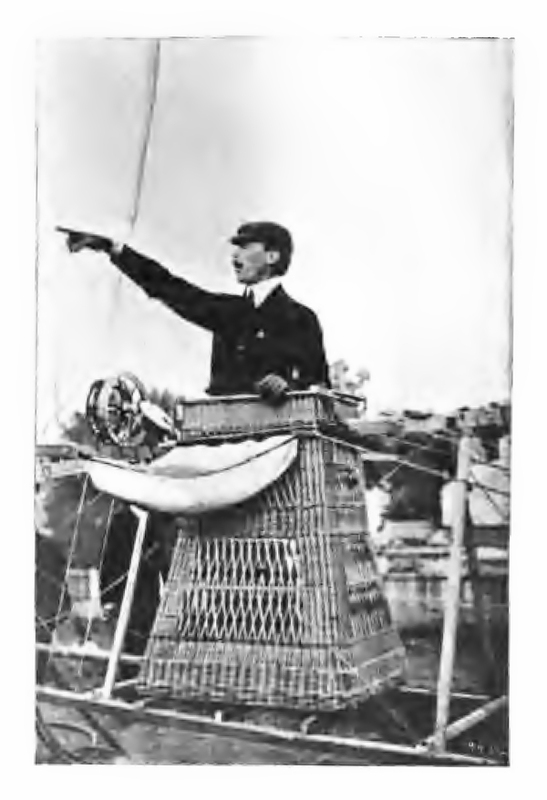 At some point the rules had been changed to make the official time of landing when a balloon’s guide rope was caught from the ground – but Santos-Dumont maintained that he was never told. . . HIs Deutsch Prize hung in the balance. In the end, good will prevailed and he was presented with the prize of 100,000 francs. Flush with the wealth of his father’s Brazilian coffee plantations, he had no need to keep the money. Instead he handed 50,000 francs to the Prefect of the Paris Gendarmerie (Police), to help support the city’s poor, and distributed the remaining 50,000 francs among his employees and airship builders in thanks for their service and devotion. Then, in an epic proof that the secret to money is having some, he received a second award of 125,000 francs – this time from the Government of Brazil, along with a large gold medal specially struck for the occasion. 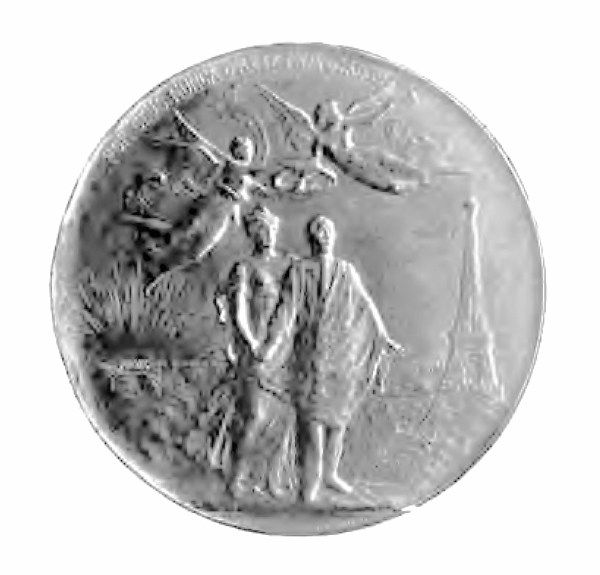 On the front ( giving a good clue to the medal’s size) was engraved Being President of the Republic of the United States of Brazil, the Doctor Manoel Ferraz de Campos Salles has given order to engrave and strike this medal in homage to Alberto Santos-Dumont, 19 October, 1901. On the back was an image of Santos-Dumont, led by Victory and crowned with laurel by a flying figure of Renown. Above a rising sun the makers engraved a line from Camões, as altered by Santos-Dumont for the streamer of his airship: Por ceos nunca d’antes navegados†. † ”Through heavens heretofore unsailed“, instead of “Over seas heretofore unsailed (Por mares nunca d’antes navegados). Santos-Dumont’s ongoing adventures in the air should need little introduction. He continued to expand the science of aeronautics in the South of France, exhibited his No.6 at the Crystal Place in London and visited St. Louis, MO, to advise the organisers of the 1904 World’s Fair on their airship events. On October 23rd, 1906, he made the first flight of a powered heavier-than-air craft in Europe, in his 14 bis canard biplane – the first anywhere to take off and land on its own undercarriage. He also designed the world’s first mass produced airplane, the Demoiselle (dragonfly) of 1908. 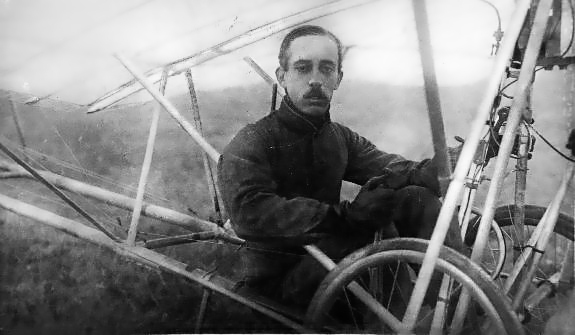 Santos-Dumont gave up flying in 1910, after a serious accident in his Demoiselle, and returned to Brazil in 1914 (having burned all his aviation notes and papers in disgust, after French neighbours accused him of spying for Germany at the start of World War One). It’s widely believed that he had suffered a nervous breakdown from overwork in 1910, and he was somewhat unstable for the rest of his life. He also contracted multiple sclerosis accompanied by – and severely aggravating – chronic depression, after his return to South America. In the end, the formidable Alberto Santos-Dumont died in Sao Paulo on July 23rd, 1932, aged 59, having hanged himself. A dark end to a brilliant life. Wow, I wasn’t prepared for the depressing turn those last couple of paragraphs took. It sad that so many of the early pioneers we revere today were driven into early graves by the stresses and lawsuits of the day. In that regard aviation hasn’t changed much since Day One. Or maybe they were all mad geniuses. I don’t know. But it’s hard to imagine the same fate befalling Rutan, Yeager, or Musk, though I recall the grim way Lindbergh and Armstrong dealt with the life-changing flights for which they’re so famous. The parallel with ground-breakers like Lindbergh and Armstrong is a really astute observation. Those pioneers who make “a giant leap for mankind” must be affected more profoundly than we realise. 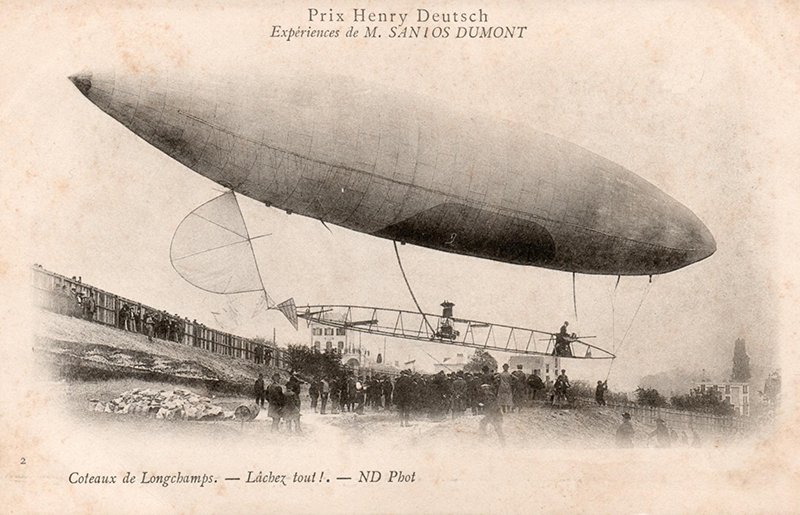 Mind you, I think Santos-Dumont could have been a contender for that Mad Genius category too. Regardless, even among the greatest giants of early aviation, he stands tall.